Renowned photographer Shin Sugino’s new commercial film studio is located on an industrial stretch on Toronto’s east side. The site of an abandoned auto mechanic’s garage and next door to Sugino’s existing still photography studio, the new studio aligns with existing neighbouring buildings, creating a continuous streetwall on the busy arterial road, Eastern Avenue. The studio occupies a simple shed building, with the façade expressed as a kinetic billboard. KPMB and Sugino experimented with materials and light to animate the studio’s presence on the street. 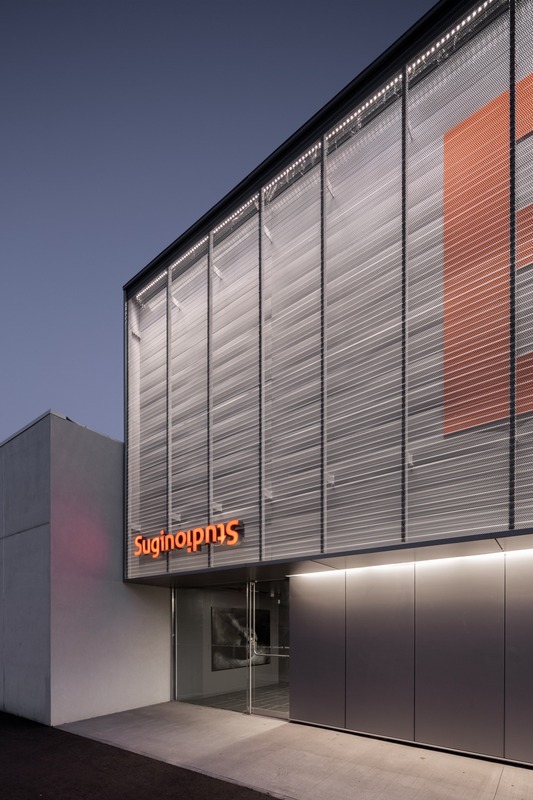 A perforated metal zinc screen held proud of the metal clad studio building, with orange supergraphics on the back metal surface was designed. The screened façade transforms from a subtle presence on the street during daylight hours to a dynamic illuminated surface at night, activating a long neglected part of the city.